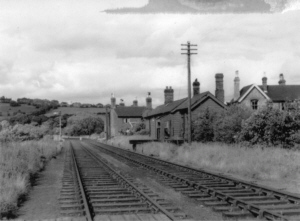 In early 2007, the only buildings still there are the old school which is in need of major repair, the railway houses and part of the wooden station building being used as a garden shed/garage. 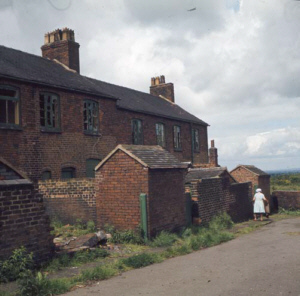 Park Terrace on Leycett Lane towards Madeley Heath still stands and is habited. Where once stood the miners welfare and institute, now stands a Portakabin office for the recycling yard. The railway cutting and bridge adjacent to the welfare are now part of the topography of the recycling yard, the former being used for landfill and the latter demolished to accomplish this. 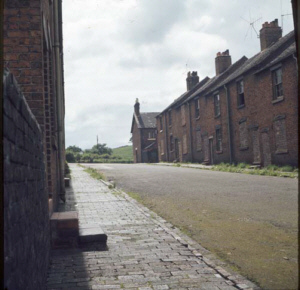 Where the main bulk of the Leycett community once lived in the terraced houses (Front Street, Middle Street and Back Street) has been completely demolished and now looks similar to an orchard, although the trees there are not fruit trees. 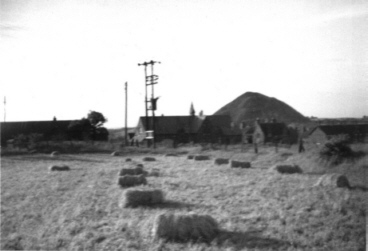 Fairlady & Bangup (Madeley Colliery) is long gone although the slag heaps though smaller than before, are still there covered in grass criss-crossed with public rights of way. 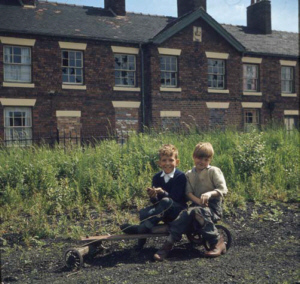 Trevor Brown – Used to live in Leycett on the farm at the top of the bank, just along from the cricket club and across from the miners institute which Les Hough owned. His father Thomas Brown was adopted by the Hough family. His many memories of Madeley include; buying sweets from Trantoms shop and having his first beer in the Crewe Arms when he became 18. At that time the Crewe Arms was run by Mr and Mrs Buckley. 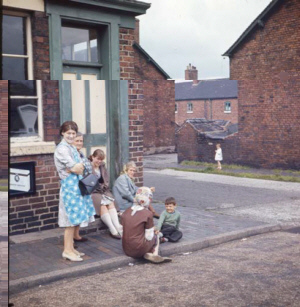 Summertime in the 1950’s and a terrier plays with a stick on Leycett Lane. The School enclosed by railings is to the left. 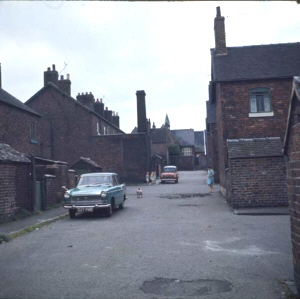 Front Street is the name for the row of houses situated on the right. In the background on the hill can be seen Scot Hay. 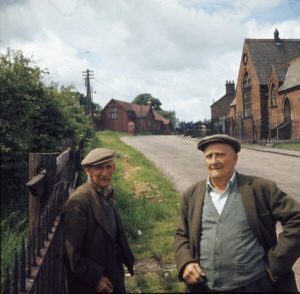 It seems strange today when passing through Leycett that it was once a thriving community. Today, all that is left of this part of the view is the school and Scot Hay. Hay baling time. 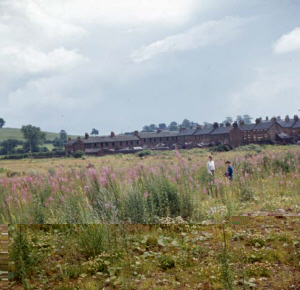 This view shows the spill heap from the colliery in the background. Across the field and behind the electricity pylon can be seen the School. Again, Front Street is to the right. 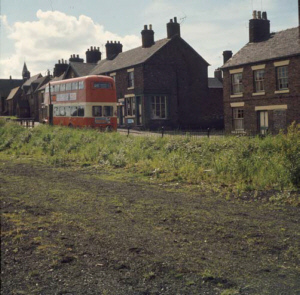 Looking from a residents window on Front Street, the Audley branch railway that ran from the Crewe to Stafford mainline on to Audley can clearly be seen. 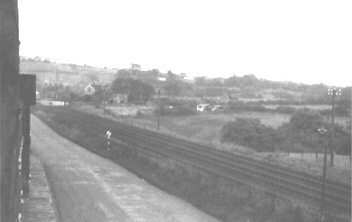 Beyond the level crossing gates is Leycett station. In the background on the hill can be seen Scot Hay. If you look today, the railway bed can just be discerned, although the railings are still there, they are rusting and partly hidden by a row of tall hawthorn bushes.